I read an interview yesterday with a celebrity hairstylist who has a very impressive roster. He’s the hair guru behind the Kardashians, Karlie Kloss, and Ashley Graham, to name a few. He says super long hair is out in favor of short, easy-to style ‘dos, and I couldn’t agree more. Not only does short hair offer a nice refresh, it’s also incredibly classy. My favourite way to style my hair when its short is to add a nice curl or wave to it. If you feel the same, you’ve come to the right place! We’ve rounded up 7 simple tutorials for how to curl short hair! From using a flat iron and a curling wand, to no heat curls and curls you can get overnight, here are the 7 techniques we swear by, plus the products that will help you achieve each one! If you want to know how to curl really short hair, you’ll love this tutorial. I love it because she shows you three different options for your curls. If you want a casual look, you can twist it and leave it to dry, if you’re in a rush, you can use a hair dyer with a diffuser, or you can add in some extra curl with a .75 inch curling wand. All the looks are great, so you can switch it up from day to day! Prior to styling, she uses the WEN styling cream and ORIBE mousse to ensure her hair stays in place. I love how simple this tutorial is, it makes curling your short hair completely effortless. She uses the Conair ceramic curling iron and emphasizes using the clamp for ease. She doesn’t section her hair, but clamps right at the root, leaving about half an inch to an inch out at the end. If you’ve always wanted to know how to get beach waves for your curly hair, this tutorial is sure to help you out! Don’t forget to use heat protectant spray before using the iron to ensure your hair’s protected. This is such an easy way to curl hair, and I love that there’s no heat involved! Heat tools really have the power to damage our hair if we’re not careful, so it’s best to go heatless as much as possible. This tutorial teaches you how to curl short natural hair. All you need for this curly hair do is a few elastics, a bandana to sleep with and some hair oil to help with the frizz (if you have frizzy hair!). And of course, you can’t forget the hairspray, to ensure your curls last all day. This tutorial is a two for one! 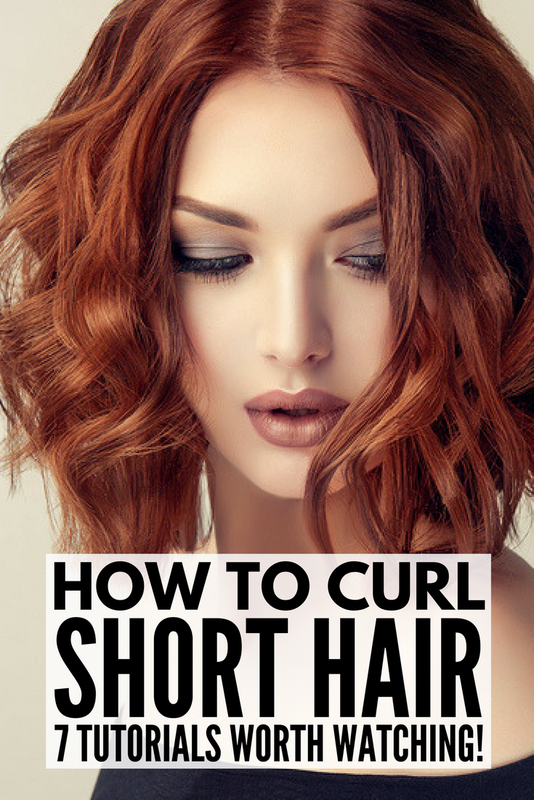 She teaches you how to curl short hair with a flat iron and how to curl short hair with a wand. She uses a GHD flat iron and the smallest curling wand in the NuMe 5-in-1 Lustrum set. She sections her hair, working on the lower layers first, moving from front to back. She demonstrates how to get both loose and tight curls with your straightener, so you can achieve different looks for different functions! This beauty guru’s natural hair reminds me a lot of my own, and I definitely know what it’s like to have to straighten and then curl your hair. For this process, a heat protector spray is essential (she uses the Tresemme heat tamer spray). She also uses the Bed Head hair dryer to dry her hair after she showers, and then straightens the ends with a CHI straightener. She finishes off the curls with a wand (this one’s great!) and gives them volume with hair texture powder. This tutorial is quick, simple, and as the title states, effortless. She says it takes her only about 15 minutes to style, which is perfect for the morning rush. She uses the Helen of Troy gold series curling iron to create perfect, bouncy curls. Her curls look so elegant, yet casual at the same time. You could definitely wear this look with a cozy sweater during the day or a little black dress at night! If you’re wondering how to curl short hair without heat, this is the tutorial for you! This is such a unique way to curl short hair that I’ve never seen before! It’s done without heat, and all you need are some bobby pins, the Suave whipped cream mousse and the Tresemme climate protection hair spray. The final look is fun, effortless and flirty and I love that you don’t have to use any heat! She emphasizes that you don’t need the curls to be perfect, it’s more about loose, tousled waves, which I must admit, are my favourite kind of curls! Here’s a recap of the products featured in this post! There are tons of different ways to curl short hair, and they all result in gorgeous looks that can take your form day to night. Make sure to use the proper techniques and products, and you’ll always get the look you want! If you liked these techniques and tutorials on how to curl short hair, please share this post on Pinterest! And if you’re looking for more hair styling tips and tricks, please follow our Fab Hair board on Pinterest!